Of course I know it is February. I am well aware the last entry was in January. No, I have absolutely no idea where the time goes. I am as confused as anyone. I know this...in the 67+ years I've been around I've never wanted Spring more than I do right now. I want Spring a lot more than I want the next electric bill that's for sure. How the folks that live in the Northern half of this country, that which is usually above the jet stream, take this year after year I'll never know. Here is a little known fact. When we lived in Coffeyville, KS we were hit with a Tornado. My mother told my dad, "Pack it up we are moving." We moved to California. At one point we lived in the town of Banning, a desert area not far from Palm Springs. It snowed...they claimed it was a 100 year storm. My mother told my dad, "Pack it up we are moving." Now we were in Southern California where the earth literally moves. Apparently that didn't bother her. Or she realized there was no where left. Oh,we went to Kansas after leaving Florida...apparently they have hurricanes in the area. And for the record, I was born in D.C.. I can only assume the move to Florida resulted from a snow storm. Earlier this month we attended the opening of the Quilts of Valor Exhibit, Wartime Quilting: Past to Present. 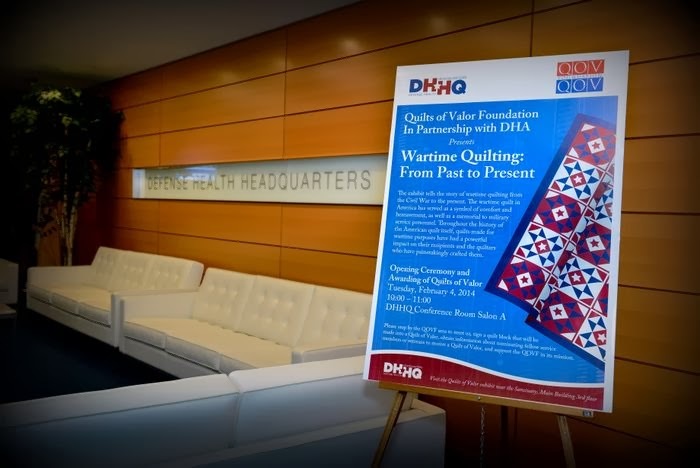 The Opening Ceremony was at the Defense Health Headquarters (DHHQ) in Falls Church, VA. The Exhibit will remain there for three months before being transferred to it's next location. The coordinator for this was handled by one of the QOVF Volunteers out of Maryland. Marianne has set the bar so high that a fire department ladder truck is going to be required for the next person organizing a QOVF Event. I'm serious, the display, logistics, facility, personnel coordination from coast to coast, after ceremony activities, the snacks...you name it. I mean we are at a military facility and she saw to it that the chocolate candy had a branch of service emblem on them. I'm eating a piece of chocolate, saying Ooh Rah, eating a piece of chocolate, saying Ooh Rah. I'm lucky someone didn't show up with one of those long sleeved white jackets with those accenting leather straps. Elaine and I, as well as another Quilts of Valor Volunteer and the Executive Director and Director Awarded Quilts of Valor as part of the Opening Ceremony. The Retired Marine Colonel that Elaine Awarded to served during Vietnam and the Marine Staff Sgt. I awarded to had a list of accomplishments from two tours in Afghanistan. So we have had a pretty busy January and February. I also taught a class at this years Birds of a Feather held here in Virginia Beach. Another great experience. I think all in attendance had a good time and learned something about PantoVision. I certainly hope so, I would like to be invited back next year. When it will again be held Virginia Beach. I'd like to thank Valerie and the Virginia Longarm Network for their support and confidence. If you longarm and you don't get to Birds of a Feather...what can I say? Check in with www.virginialongarm.com for BoF details for 2015 in a couple of months. I know so what else have we been doing? Just a little quilting. Well it's been rainy, cold, snowing. Can't ride the motor, can't golf, might as well longarm. And what about Elaine? Well as we all know I don't quilt...but she does. She finished up one of the tops from Quilts of Valor National Sew Day. And she is working on Moon Over Parador...yet to be determined...quilt or wall hanging, also for MQS. Not to mention she has taken over the duties as Virginia State (Commonwealth) Coordinator for QOVF as I have taken on a new roll with QOVF that will evolve around training. We think 2014 is off to a good start and really looking forward to what is ahead...especially Spring. HAHA! I hadn't realized you lived in Coffeyville, KS. I live in Manhappiness, KS. :) I teach and had a new mother come in this week to discuss the weather with me. She moved to Japan, they had a tsunami, she moved to Kansas we are having our coldest/wildest winter in 40 years. She told me to watch out because bad weather follows her everywhere! She reminds me of your mom. Thanks for keeping your blog. I enjoy reading it.